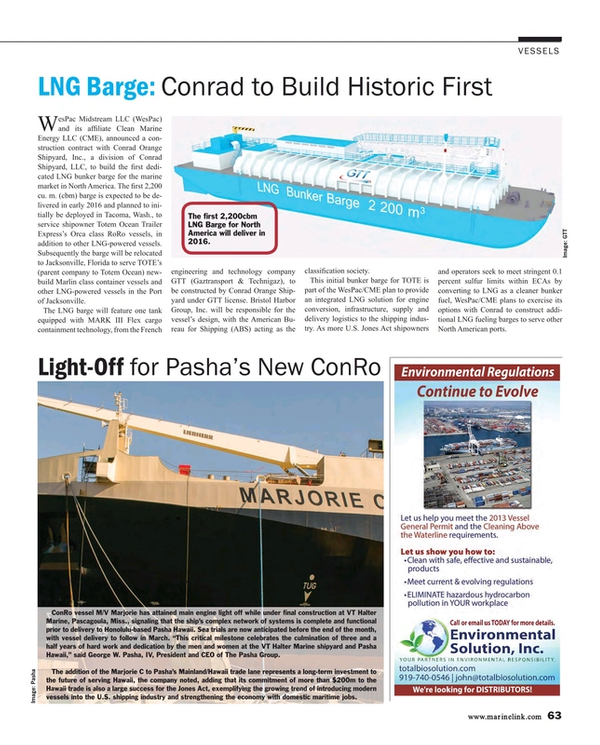 ConRo vessel M/V Marjorie has attained main engine light off while under final construction at VT Halter Marine, Pascagoula, Miss., signaling that the ship’s complex network of systems is complete and functional prior to delivery to Honolulu-based Pasha Hawaii. Sea trials are now anticipated before the end of the month, with vessel delivery to follow in March. “This critical milestone celebrates the culmination of three and a half years of hard work and dedication by the men and women at the VT Halter Marine shipyard and Pasha Hawaii,” said George W. Pasha, IV, President and CEO of The Pasha Group. The addition of the Marjorie C to Pasha’s Mainland/Hawaii trade lane represents a long-term investment to the future of serving Hawaii, the company noted, adding that its commitment of more than $200m to the Hawaii trade is also a large success for the Jones Act, exemplifying the growing trend of introducing modern vessels into the U.S. shipping industry and strengthening the economy with domestic maritime jobs.